Mr Gandhi, 47, who arrived in the US yesterday on a two-week-long tour, addressed students at the University of California, Berkeley, to reflect on contemporary India and the path forward for the world's largest democracy. Demonetisation imposed a devastating cost on India, Rahul Gandhi alleged. 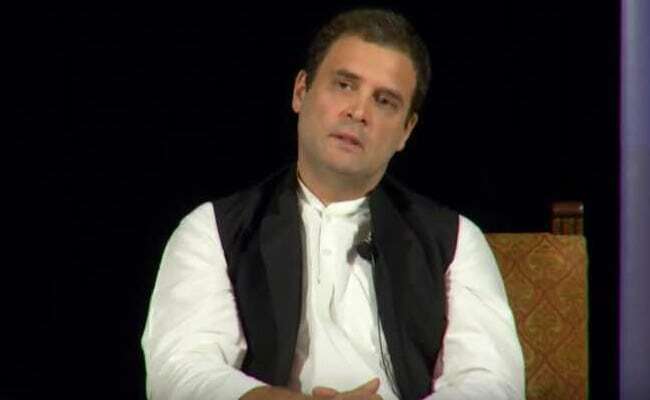 Washington: Congress vice president Rahul Gandhi today criticised Prime Minister Narendra Modi's economic policies, accusing him of causing "tremendous damage" to India's economy with "reckless and dangerous" decisions like demonetisation and "hastily-applied" GST. He said the November 8 demonetisation decision was taken without asking the Chief Economic Advisor and Parliament, which caused tremendous damage to the economy. Demonetisation, he alleged, imposed a devastating cost on India. "Ignoring India's tremendous institutional knowledge and taking such decisions is reckless and dangerous," he charged. He said 30,000 new youngsters were joining the job market every single day and the government was only creating 500 jobs a day. "This does not include the massive pool of already employed youngsters," he said. "The decline in economic growth today is leading to an upsurge of anger in the country. The government's economic policies demonetisation and hastily-applied GST have caused tremendous damage," he alleged. Goods and Services Tax, a tax regime which combines all of India's states and union territories into a single market, was launched at midnight on June 30. Mr Gandhi also accused the government of wiping out millions by demonetisation. "Millions of small businesses were simply wiped out as a result of the demonetisation, farmers and many who use cash were hit extremely hard. Agriculture is in deep distress and farmers suicides have skyrocketed across the country."